Bring your little ones for some creative face-painting time! Truckee-Tahoe Air Fair and Family Festival is a FREE inaugural event, complete with live music, kid-friendly activities, a food court and beer garden, aircraft fly-bys, static aircraft displays with pilot docents, free FAA Chapter 1073 Young Eagle flights for kids ages 8 to 17. You can even ride your bike and park at the free Truckee Trails Foundation Bike Valet, from 7am to 4pm. Opening Ceremony kicks off at 11am. Kids fly for free 8am to 12pm. Presented by the Truckee Tahoe Airport District. Dine on a delectable lobster dinner overlooking Lake Tahoe at the Kings Beach Event Center Terrace, to benefit The Rotary Club of Tahoe City. With the stunning view of Lake Tahoe, in rain or shine (inside lake view seating available for inclement weather), enjoy the seafood feast. There are also raffle prizes as well, so you could win big! 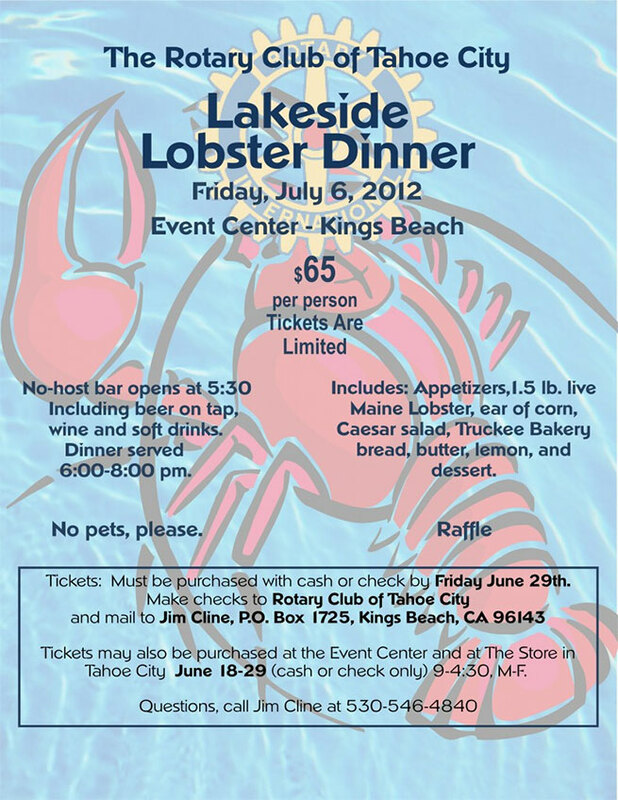 Tickets are limited and must be purchased by June 29, so this is the last day to reserve your seat (and lobster)! No host bar opens at 5:30pm; dinner served 6pm to 8pm, $65/person. Are you a lobster fan? We bet you already have plans for the July 4th holiday. You’ve created the menu and prepped the grill. You’ll host your annual Independence Day soirée. Perhaps travel to the lake house or rough it in the great outdoors with other campers. Spend the afternoon on water; kayaking, boating or paddleboarding. You’ll top off the holiday with tradition: fireworks. If that’s not the case, and you’re in the Lake Tahoe-Truckee area, here’s what you can find for the whole family! Enjoy the fair along the cobblestone Kings Beach Plaza – just 50 yards from the water – which has been running for more than 30 years. All work and masterpieces created by participating artisans. Shop nearby shops and choose from an array of local restaurants. 10am to 5pm, 530.546.2768 for details or questions. Watch the full moon rise over Lake Tahoe at this stunning lakefront location! Drink in the romance while being serenaded by a solo violinist. 5pm to 11pm, reserve your table or choose a bar seating, West Shore Café & Inn. Enjoy the spectacular view on the lawn at West Shore Café & Inn with this live performance. A lifelong drummer, Peter Joseph Burtt, attributes his musical influence to time spent in Africa. Much of his music is played on traditional instruments: the lute like Kora, the Mbira, or thumb piano. 2pm to 5pm, free, West Shore Café & Inn. Watch the fireworks over Lake Tahoe from the sandy beaches of Kings Beach, CA. 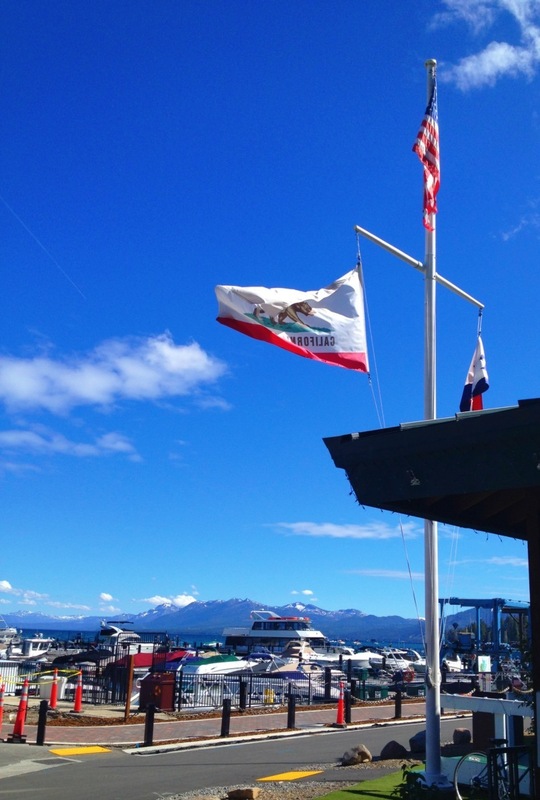 Make it an evening by purchasing tickets to North Tahoe Business Association’s Deck Party, and enjoy premium seating, food vendors, live music and a no host bar. 6:30pm, Kings Beach, CA, 530.546.9000 to purchase tickets. Run to the Beach 5k and 10k starts at the North Tahoe Regional Park. From the park you have the option of participating in the 5K or 10K trail run, both of which finish on the “big” beach in Kings Beach, CA. 8am, registration cost varies $30-$55, Tahoe Vista, CA. Start off the 4th of July with a bang and race the one mile fun run from Tahoe Forest Hospital to Historic Downtown Truckee, through the crowds waiting for the parade to star. Registration opens at 9am, run starts at 10am, $20/adults, $15/children, benefits Auburn Ski Club Nordic Programs, Truckee, CA. Celebrate Independence Day at Commons Beach for a spectacular fireworks show! 9:30pm, Tahoe City, CA. Enjoy Independence Day fireworks over Donner Lake from West End Beach. The West End Beach event is just for Truckee Residents and Homeowners, but the public can view the fireworks from anywhere around the lake. Dusk, $6.00/advance entry fee, 530.582.7720, Donner Lake. Independence Day festive parade traveling 1.5 miles on Donner Pass Road from Truckee High School Track parking lot into Historic Downtown Truckee, 10am to 12pm, $50 parade entry fee, Truckee Chamber of Commerce, Truckee, CA, 530.587.2757. What’s on the agenda for your July 4th holiday? A highly coveted “must-do” summer event, don’t miss the 40th anniversary season featuring The Two Gentlemen of Verona. 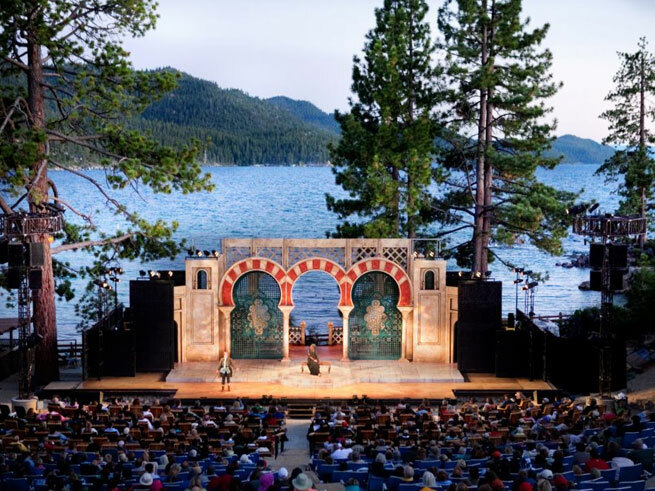 Pack a picnic and watch the sun set on Lake Tahoe’s East Shore while Shakespeare comes alive on stage. Shakespeare’s The Two Gentlemen of Verona is one the whole family can enjoy, and full of comedic relief. Bosom buddies Valentine and Proteus are Verona’s closest comrades, but their friendship is put to the ultimate test when Proteus forsakes his beloved Julia and competes for the affections of Valentine’s newfound love, the strong-willed Silvia. Tickets start at $15 (Youth) $25 (Adult) and vary in service and assigned seating. What is your favorite play by William Shakespeare? 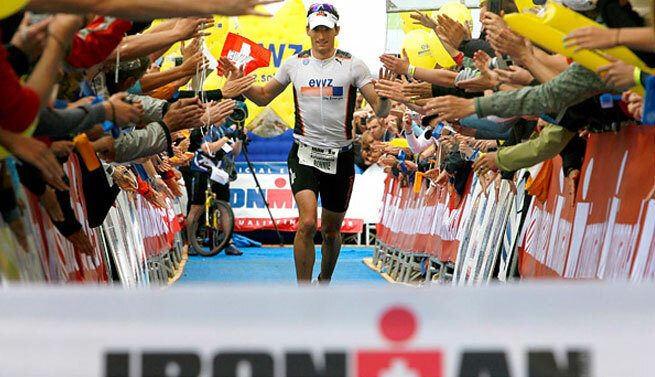 IRONMAN slots generally sell out, as Lake Tahoe 2013 did in 19 hours. General entries are sold out! But are you really that surprised? Ten days ago the North Lake Tahoe Resort Association announced it will host the first full-distance IRONMAN® event in California since 2001, scheduled for Sunday, Sept. 22, 2013. Registration opened Monday, June 18 at noon PST and filled in just 19 hours! We can understand the demand for the first full-distance IRONMAN event in California in over 10 years. IRONMAN Lake Tahoe will start with a two-loop, 2.4-mile swim in the pristine waters of Kings Beach, California. Athletes will enjoy a lakeside transition before starting a two-loop 112-mile bike course that is challenging and comparable in difficulty to the bike routes at IRONMAN Lake Placid, IRONMAN Canada and IRONMAN Wisconsin. Cyclists will travel along the lake into Tahoe City before following the Truckee River past Squaw Valley and into Historic Downtown Truckee. From there, the course turns south back toward Lake Tahoe, has a short loop in Martis Camp, continues past Northstar California and climbs to Brockway Summit. After a decent back down to Kings Beach, athletes will complete a second loop, and then a final, flat 17 miles to finish the bike course at Squaw Valley. Definitely a gorgeous loop, but not for the faint of heart! With a transition to the running portion at The Village at Squaw Valley, runners will proceed along the Truckee River bike path into Tahoe City, and continue south along the shores of Lake Tahoe to a turnaround in Homewood, California. The flat course traverses one of the most scenic lake vistas in the world before finishing back at the heart of the Village at Squaw Valley. IRONMAN Lake Tahoe will bring approximately 2, 500 athletes to the region, and is also a multi-year contract for the Tahoe region. Are you an IRONMAN? If so, does Lake Tahoe sound like an appealing course? Sip, stroll and scope your way through the Village at Squaw. 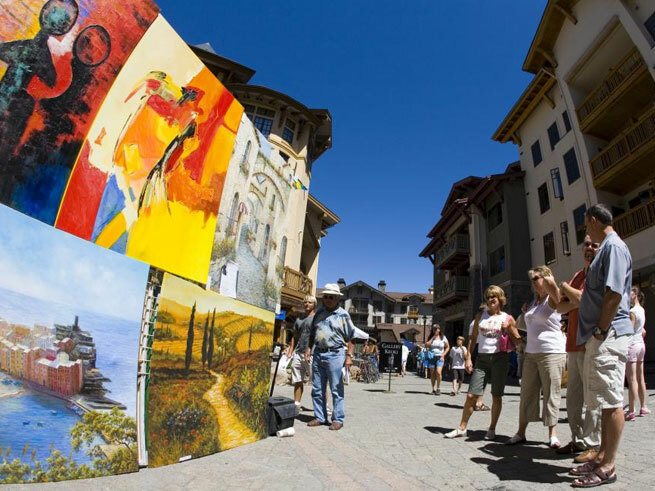 The Art, Wine & Music Festival is a perfect combination of three of your five senses: the burst of colorful art, the taste of delightful red and white wines, and the sound of premier performers and musicians. The two day event features two performance stages, restaurants and shops, and walkways lined with fine art booths and exhibits. Hunt for new art. Taste refreshing vino. Soak in live tunes at the Village Plaza — who’s in? Wanderlust California is back at Squaw Valley for another year of non-stop action; a huge festival that artfully brings together the world’s leading yoga teachers, top musical acts and DJs, notable speakers, renowned chefs, and winemakers for a 4-day event like no other! Take several days of yoga classes from the best in the industry. Attend a Speakeasy lecture where experts in wellness discuss meditation, nutrition, technology, music, organics, spirituality, yoga, and more. Enjoy a morning meditation hike at the top of Squaw. Watch Ziggy Marley live on the main stage. Sip tea at an outdoor co-op or attend a prix fixe farm-to-table dinner with The Naked Grape. Tickets are $475/Sage four-day, $395/Seeker three-day, $108/Thursday, $160/Friday or Saturday, $99/Sunday, $24.50/Thursday music only, $29.50/Friday music only, $34.50/Saturday music only, $20/Sunday music only. Overwhelmed with excitement? We thought so! Check out Wanderlust Festival’s website to learn more!